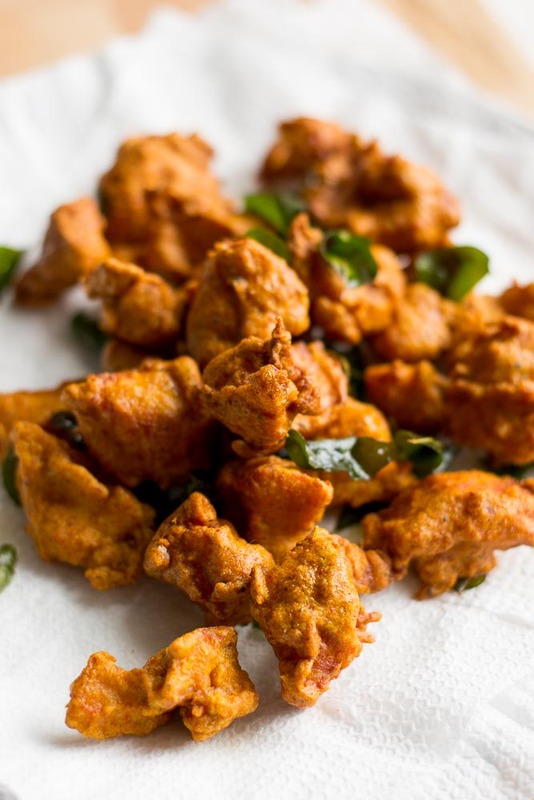 Chicken 65 is the most quintessential restaurant style dish that’s a must order in a Tamilnadu style non-veg restaurant. It is believed that the dish was introduced by Madras Buhari restaurant in the year 1965. Hence the name. Its nothing but deep fried chicken in a coating of a spicy masala. The key to a good fried chicken is in the juiciness of the cooked chicken. The chicken should not become dry. A good marination will help in tenderizing the chicken. Here is how to do chicken 65. The secret ingredient in my marinade is the whole wheat flour / atta. It coats the chicken so well and it fries very crisp in oil. I also add an egg in the marinade. The eggs tenderize the chicken pieces and helps in retaining the moistness after cooking without making the chicken go dry. 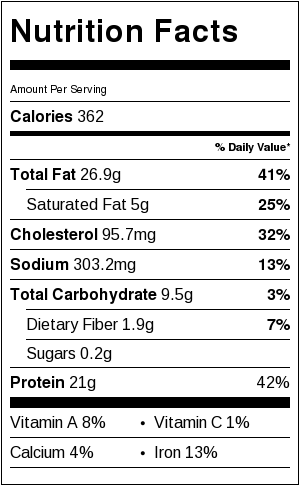 We will be using 2 boneless chicken breasts for chicken 65 today. Cut the chicken into small bite sized pieces so they cook fast. Add the chicken pieces to a bowl and add in all the ingredients for the marinade. Mix well to coat evenly. Let the chicken marinate for 30 minutes to an hour at room temperature. Set aside. Heat oil in a pan until hot. Add the marinated chicken pieces to the oil. 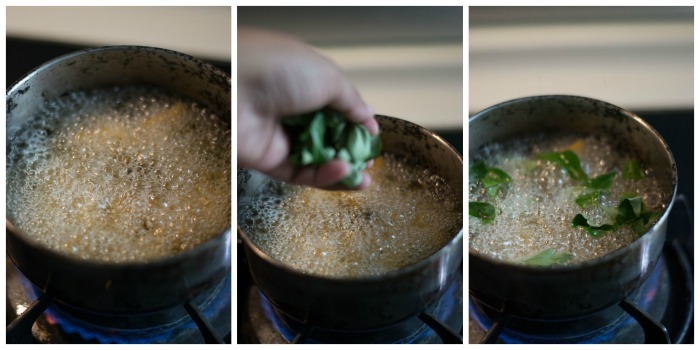 Add a handful of curry leaves to the oil at the same time. 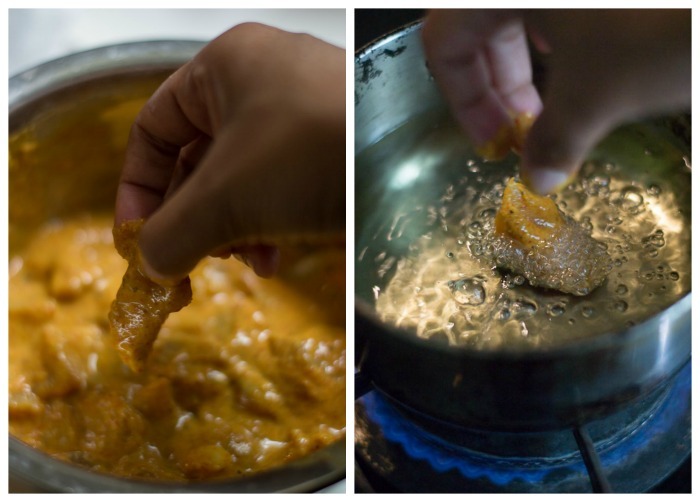 Here are some points to note while frying chicken so the chicken doesn’t become hard. # Do not fry chicken in really super hot oil. Let the flame be at medium high at all times. Frying in really hot smoking oil makes the chicken hard and rubbery. # Do not crowd the pan. Add only as much the pan will hold without crowding. # Boneless chicken breast cooks fast after marination. Once the bubbles in the oil subside, its an indication that the chicken is done. Remove and drain on paper towels. Continuing to cook the chicken even after the bubbles have mostly subsided will give you hard chicken. Some bubbles will remain and that’s fine. # It took not more than 2 minutes for me for each batch of chicken. Take a chicken piece from oil and break it into two. If the meat is white inside, its done. Do not over cook the meat. When most of the bubbles have gone, remove the chicken pieces from oil. Drain on paper towel. 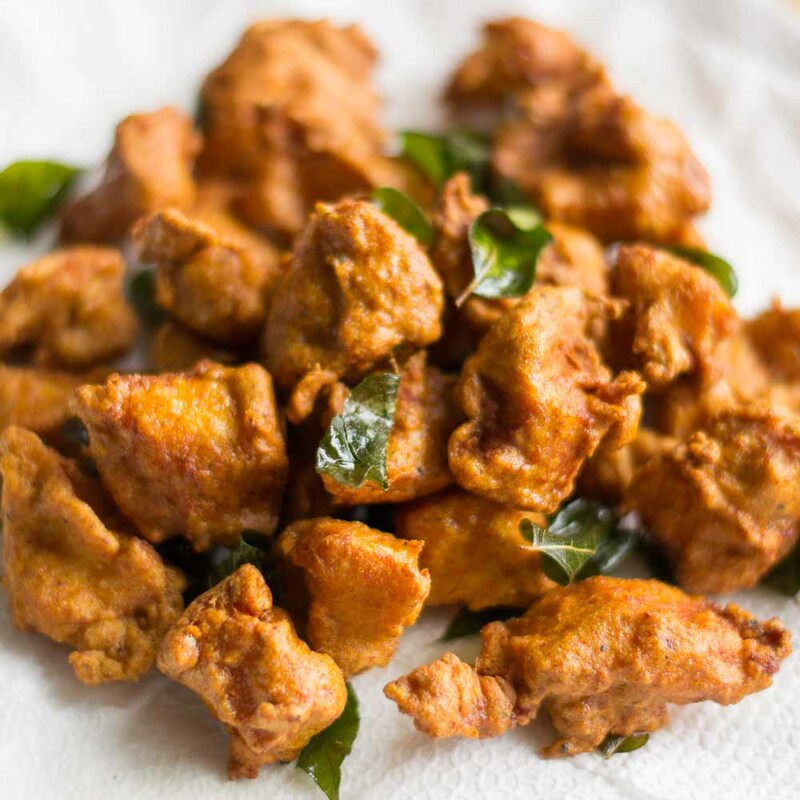 Tamilnadu style Boneless chicken 65 recipe made with chicken breasts marinated in a spicy masala and deep fried in oil. Add the chicken pieces to a bowl and add in all the ingredients for the marinade. Mix well to coat evenly. Let the chicken marinate for 30 minutes to an hour at room temperature. Set aside. For a deep red color, you can add a pinch of red food coloring to the marinade. This is an optional ingredient. I have not added any food coloring. Thanks so much for sharing this recipe. My family just loved it. The surprising part was my kid who doesn’t like greens/veggies loved the fried curry leaves along with the chicken. Thanks. Glad you liked Chicken 65! Your recipes are very good. Simple but comes out well. Keep it up! 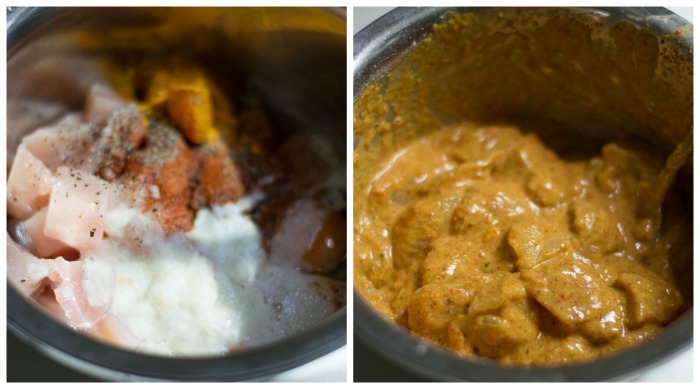 Tried your prawns masala , which came out very well. 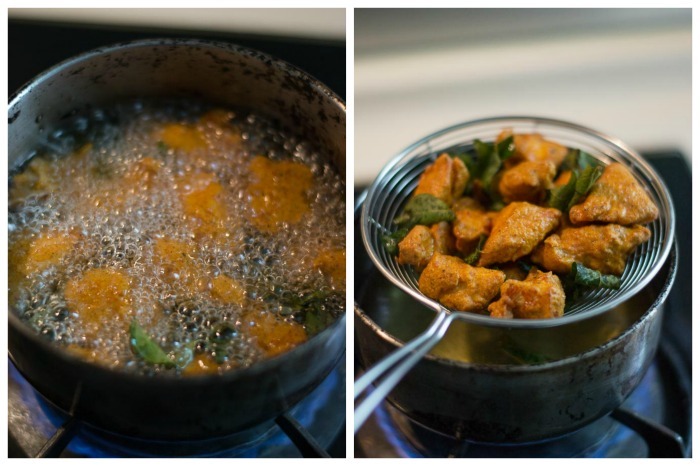 Hi Kannamma- Thank you for sharing this recipe! I am wondering if there is an alternative to deep frying the chicken- would shallow frying or oven grilling work as well? I have never tried grilling this recipe. I doubt if it will give the same texture we are looking for. I have tried many of your recipes.. this one tasted very good. My usual recipes are sambar, puli kulambhu, dindugal fish curry, chicken and many.. I like your food taste, may be because even i am from coimbatore. Keep going ! Thanks you very much for sharing these recipes. This was part of dinner yesterday with rice and sambar. Rated 9/10 due to ease of preparation and taste. Also I made a roll. Rolled the chicken in a chapathi with finely chopped onion, tomato, coriander, green chilli. (This tends to unravel and stuff falls out the bottom so had to hold it with both hands.) But tastes great. Thank you. Really glad you tried it!